Unlike Blogger, WordPress blogging platform has loads of functionality with refined looks. Blogger now has option to embed comment form on post page but look-wise it is pretty ordinary. You cannot customize it or add comment fields like on WordPress powered blogs. Well, you can do that using 3rd party commenting system on blogger like Intense Debate and Disqus. Besides the looks, it adds more functionality to commenting system on your Blogger blog. It adds featuring like threaded comment, subscribe by email, widgets, Twitter, RSS tracking and above all look & feel of more refined WordPress like comment box. 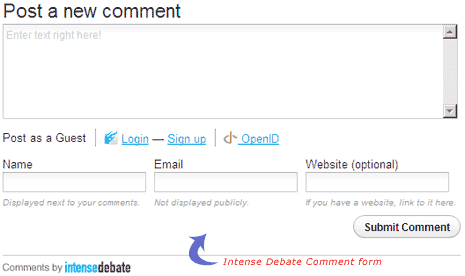 Procedure to add Intense Debate or Disqus comment box to Blogger blog is eaysy and similar. It does not involve any manual code editing, everything is automated. 1. Login into Blogger blog, goto Layout > HTML. 2. Download your existing Blogger blog template. 3. Create new account at Disqus or Intense Debate and upload the downloaded template. 4. You will receive modified template, paste / upload it on your blogger blog under edit HTML option. 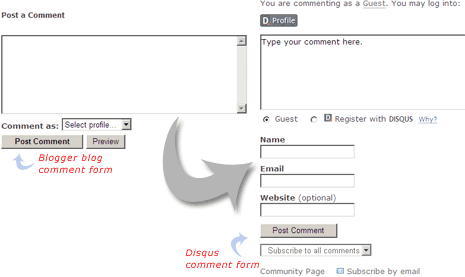 See detailed procedure to add Disqus comment box to Blogger blog. Give a makeover to your Blogger blog with all new comment box look-wise and feature-wise using Intense Debate or Disqus commenting system. One more way to make your Blogger blog PRO. Well yes that’s why WordPress is such a popular.Most of the requirements are by-default provided by WordPress.I think other than WordPress blogs like blogger,Disqus is the best third party tool.Its very popular now a days. How can I create a comment like your site? Thanks! I’ve been searching this for some of my blogger sites. Very helpful. Thanks for this great info. I will try this one to my site..
How do I add comment box on my personal webpage? Great!Thats what i am looking for.I will definitely use this for my next blog.Thanks for sharing. hey if we can put picture in comment i think it is better than this ! It was only a matter of time.. Thus the epic failure of Google Friend Connect begins. Hey Thanks man.. It was a very explanatory article and helped me in changing my comment box at blogger. Wow … this is a great blog! Pretty informative as well! That has really helped me a lot in learning some of this stuff that I wasn’t familiar with. it doesn’t work for me too.. any ideas? The code generated from disqus is not matching with my blogger. Not working for me. anybody got the same problem? Thanks for this post – I really like it and hope you get the best out of it. I like your comment system, can you teach me how. not the intense debate disqus. The way specified here to make comment box is too good and want to know more things here.. I tried it but it didn’t work please help me!!!! i like your’s comment form, how can i edit my blog to use this one? ?